“It’s better to stand out in a crowd than blend in.” That’s the caption my 18-year-old daughter, Sarah, put on one of her Instagram stories recently, along with a note that said “I will never stop being myself.” I cannot think of anything that would make me prouder as a parent than having a teenager who knows their worth and realizes that they are exactly perfect just as they are. Disclosure: In exchange for the honest review of our experience which appears in this post, our family received several books from Candlewick Press for free. We were compensated for our time completing the review, but we’ve easily spent quadruple that time with these books already because we like them so much! I give Sarah a ton of credit for being her own person, but I also know it’s not an accident. The choices I’ve made as a parent – especially as a homeschooling parent – have definitely helped to shape her perspective. In our family, we try to celebrate the rebels, the oddballs, the unique. We watch movies and read books and talk about people who dare to be different – whether that’s women throughout history, innovators like Shakespeare and Leonardo da Vinci, or people who don’t fit into the majority because of their race, ethnicity, sexual orientation or political views. One of the coolest things we do is keep a fully stocked “book basket” on our coffee table with things all of us can pick up and browse, and we definitely try to use that space to reflect literary rebels, both factual and fictional. Recently, I added a big collection of books from Candlewick Press and they’ve been amazing! You could use these as the basis of a unit study – either on one particular person or group of people, or overall to talk about being a rebel! 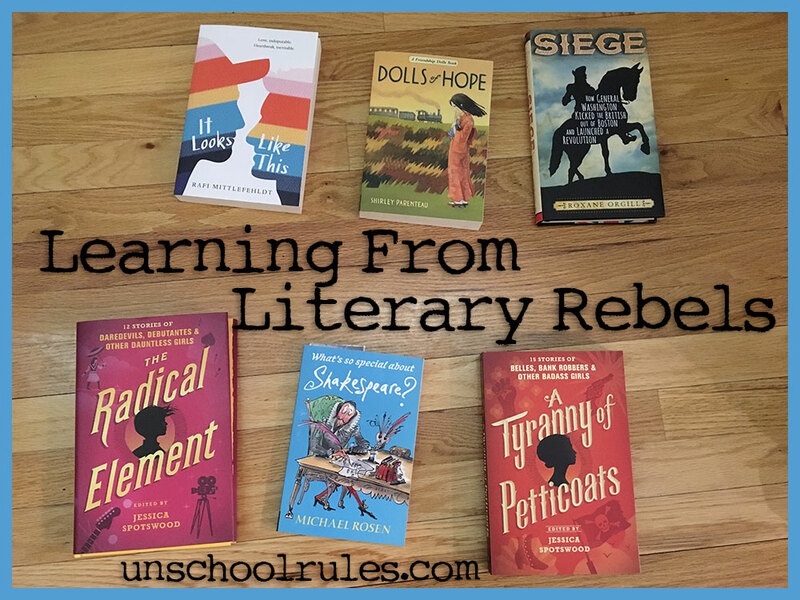 If you’ve been following Unschool Rules for any time, you probably know how much Sarah is into history. This is a great book that’s shown us a lot we didn’t know about Shakespeare. Sarah and I are actually reading it aloud together (yes, family read-alouds can still be AWESOME when you have teens!) and have learned a bunch – including how Shakespeare sort of stole a theater, that he has no direct living descendants, and how he uses language tricks to make specific points. It’s an easy read, probably designed more for middle grades than high school, but still interesting even at Sarah’s age (and mine)! What is the role of theater in social/political commentary? Shakespeare went out of his way, usually by using comedy, to deliver very pointed insults to certain groups of people, even powerful ones. We talked about how this happens now in more modern plays that go out on political limbs, like when the Hamilton cast delivered some pointed words to Vice President Mike Pence. How is our language today different than Shakespeare’s, or influenced by Shakespeare’s? If you’ve ever used the words “manager” or “uncomfortable,” you owe a debt to Shakespeare. Yet while those words continue to be important today, there’s a lot of Shakespeare’s kind of language that has died out. Sarah, for her part, loves the original words, because they have a lot of nuance that she says helps you tell what emotions the characters have, more than “regular” language would. She also points out that because you have to stop and ask questions, it makes you slow down and consider the meaning more. Is imitation the sincerest form of flattery? We found out from this book that Shakespeare… well, he kinda cribbed some major plot points and even some whole phrases and ideas directly from old stories. A Roman book by Plutarch, for instance, describes Cleopatra riding in a barge “the poop whereof was gold, the sails purple, and the oars of silver,” and Shakespeare, in Antony and Cleopatra, describes “The poor was beaten gold; purple the sails… the oars were silver.” So… is that OK? Nowadays we have a different idea of giving credit, but what do you think about this happening at the time? The Revolutionary War, told as a series of poems? OK, I’m enough of a lit nerd to think that’s pretty cool, but I wasn’t sure Sarah would love it, given her general “just the facts” mentality. But we ended up having a great time and coming up with some great conversation points. Was it OK that Washington owned slaves? This was a big question for Sarah – whether someone can be considered a hero even if they do something we consider “wrong.” We talked about the culture of the time, but we also talked about how Arnold Schwarzenegger is one of Sarah’s heroes even though he cheated on his wife. What’s an acrostic poem? This isn’t a life lesson by any means, but there were multiple acrostics in the book, and Sarah and I worked together to create an acrostic poem about ways in which she’s kind of a hero herself, using the letters of her name as the first lines. What made George Washington a good leader of the Revolution? We think it’s because he was willing to think outside the box – for instance, by letting black people into his decimated army to bolster his forces, even going against his advisors to do so. This is Sarah’s “I’m a rebel” face. I get the idea from talking with other homeschooling parents that most of us are pretty confident about the idea of learning from books about real people – I even have a whole post on homeschooling with biographies that delves into that. But there is so much to learn from fictional characters as well, and I think we forget that sometimes. These books might not be 100% true, but there are DEFINITELY opportunities in them to talk about people who dared to be different – fictional literary rebels, as it were. These anthologies are absolutely full of great stuff. In the preface to each, Jessica Spotswood describes working with contributing authors to tell stories featuring women and girls who were on the fringes of society, or radical for their place and time. 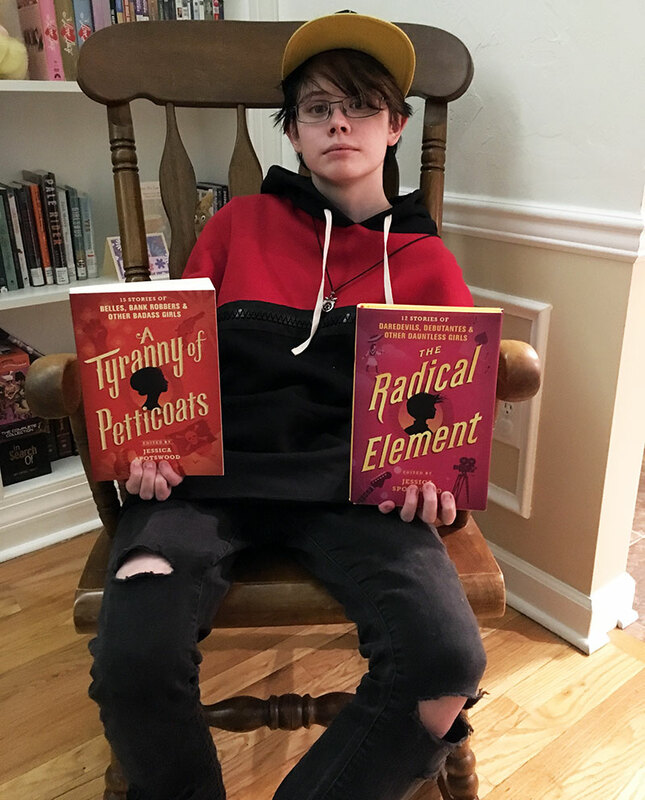 My favorite was the opening story in The Radical Element, about a Jewish woman in the 1800s who wants to read the Talmud for herself, which was crazy controversial at the time. There are also stories about women of color, queer women, women who want to vote, women who want to work outside the home, and more. It gives me some hope that we are starting to hear more and more men speaking out in favor of gender equality, standing up for the rights of women, and acknowledging female contributions to society. In our Women’s History Month-themed #LoveOurGirls newsletter, #RyanCoogler, @PaulBettany and others reflect on the historical female figures that most inspire them. Link in the bio. The struggle for gender equality cannot succeed without the participation of men. This #WomensHistoryMonth I wanted to give the floor to men who wished to share who their favorite women in history are, and why. Let’s celebrate some of the women whose powerful legacies have affected the lives of men across the globe, and across time. Read more in our March #LoveOurGirls newsletter which is now live. Link is in the bio. What makes something radical? These books led us to talk a lot about time, place and culture. As in, what was radical for a woman in the 1940s – like, you know, pants – is pretty commonplace today, though it would still be radical if, say, you lived in an Amish community like the many near us. Are there any ways in which you – or someone you know – is “radical”? We have a pretty unusual family. Divorced couple still living together, with one person (me) engaged to someone else, who I’m living with despite not being married? Teenage girl who presents visually as a teenage boy in clothes/hair? We sort of stand out in a crowd, is what I’m saying. But the “radical” stuff really isn’t about those appearances. We think we practice radical kindness, saying yes any time we can help. We think our unschooling lifestyle is pretty radical. We’ve gone out on a limb, started a nonprofit and given away more than 500 stuffed penguins. That’s the kind of radical we are. What elements have been historically missing from coming-of-age stories? One of the reasons these anthologies were so powerful to me is that they featured characters who are young women coming of age. 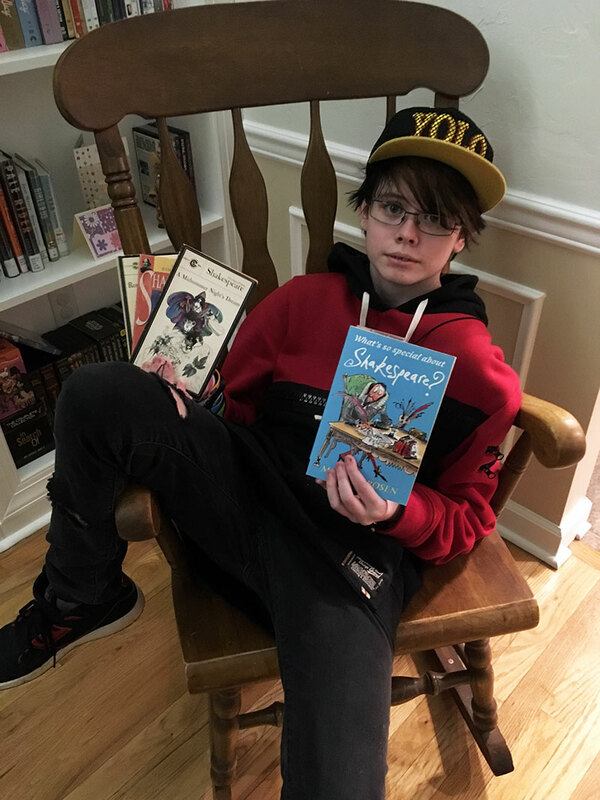 Dan mentioned that the “classic” coming-of-age novels – Johnny Tremain, Catcher in the Rye and the like – are all strongly white heterosexual male. More books have started to include females, but what about women of color? What about gay or trans women of color? Those stories are just starting to be shared, and these books are a huge step in the right direction. What types of women from these stories or from real life do you consider inspiring? Sarah says Danai Gurira, who we mentioned above, but she also gave big shout-outs to Ellen Degeneres and Michelle Obama. She also mentioned Walking Dead actress Alanna Masterson, who had a great post recently on body positivity. What happens when your parents have different ideas about what’s acceptable than you do? “Compromise?” Sarah (who has never had parents tell her she can’t be anything except who she is) suggests. What’s the role of religion in your life? Does following some particular religion shape who you are so much that it can change your views on things like gender preference, or can those things coexist peacefully? This fictional story is based on the real-life friendship doll project, a program designed to ease cultural tensions between Japan and the U.S. in the late 1920s, following World War I. U.S. schoolkids sent 12,000 dolls to Japan, and this book explores the story of one young Japanese girl, Chiyo Tamura, who is chosen to be a protector of one of those dolls, and to help craft one of the 58 dolls Japan would go on to send back to the United States. It’s an incredible elementary or middle-grade read that gives a lot of background into the Japanese culture. Can being peaceful be rebellious? At a time when these two cultures were pretty tense, one of the biggest acts of “rebellion” was to accept the goodwill gesture of the dolls for what it was, and to offer dolls in return. We don’t usually think of peace as an act of rebellion. What is the value of honor? The book begins with Chiyo dishonoring her family by being caught spying on the man her sister is to marry. That’s considered dishonorable and she is sent away on a journey that will eventually lead her to the dolls. But is it really “dishonorable” to have tried to protect her sister? What does it mean to be honorable? If you order these or any other books from Candlewick Press online, use discount code CANDLEWICK at checkout for 25% off! Also, Candlewick Press is giving 30 winners a paperback copy of Judy Moody #1. You must be a U.S. or Canadian resident to enter, and the giveaway closes at 11 p.m. April 18! Find out more by following Candlewick on Facebook, Twitter, Pinterest and Instagram. This entry is about books, curriculum, parenting, reading, reading roundup, reviews, unit study, unschooling. The previous post was Unschooling: Our March 2018 adventures. The next post is Unschooling: Our April 2018 adventures. Hi! just wanted to mention the series “Turn” available on Netflix. Our family really enjoyed watching this, learning about George Washington’s spy ring! WOW, so interesting! The show does a great job with showing different perspectives during the Revolutionary war. Maybe your family has watched this, if not, its great! Jaime, I had not heard of that – thank you so much for the recommendation! We will definitely check it out!